Although Sophie isn’t quite at that age yet, I wanted to tell you guys about a really great skin product out there for kids and pre-teens, called kidskin. I remember growing up and dealing with multiple kinds of skin issues. My complexion wasn’t always this clear! Like many teens, I struggled with acne, but mine started much earlier than I would have liked. I remember trying all sorts of cleansers, lotions, and masks. They either made my face too dry, too oily, too red, or all of the above. They were just too harsh and probably not the best for my adolescent skin. Unfortunately, we were unaware of any effective products on the market that were gentle enough for my pre-teen face. Fast forward to today, to kidskin, a product made for kids between the ages of 8-18 that are free of parabens, sulfates, fragrances, and glutens, making it safe for all skin types and for daily use. Their kidskin Acne Kit includes the T-Blast Foaming Cleanser, Z-Blast Clarifying Serum, and Calming Moisturizer. The cleanser will help to remove dirt and oil, the serum is a spot treatment that will reduce pimples, and the moisturizer will hydrate dry skin. If Sophie’s skin ends up following in her mom’s footsteps, I’ll know exactly which products to trust. It also helps that Kidskin is Dermatologist and Pediatrician Recommended, Cruelty Free and Vegan, and made in the USA. 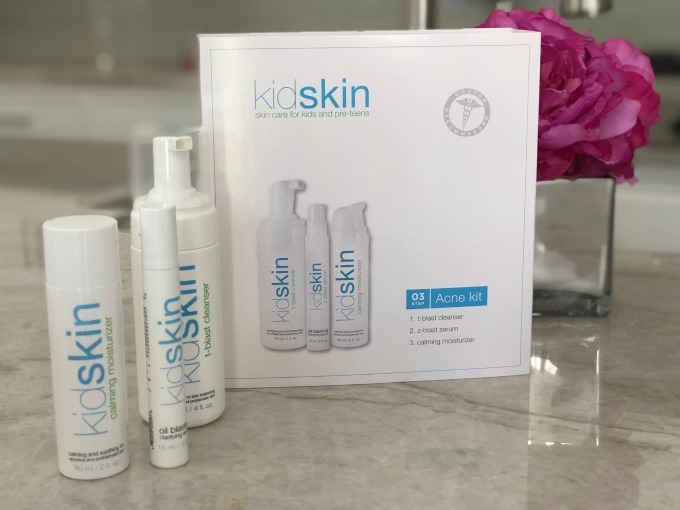 If you’re looking for a safe, gentle, solution for your child or pre-teen’s acne, sensitive skin, or even eczema, I recommend you check out kidskin. Find out more about kidskin here!